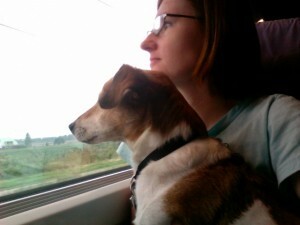 I am writing this from the comfort of the Thalys high-speed train to Paris Nord. We departed from Amsterdam about 30 minutes ago. Our seats are in first class (Comfort 1) and are very spacious. There is free wi-fi for first class passengers which is a great bonus. The attendant has already visited our seat 3 times – offering sandwiches, drinks and coffee/tee. She even gave us a little cup of water for Bodie! We have a Eurail pass but there is a seat supplement for the Thalys train since they are the high-speed train. 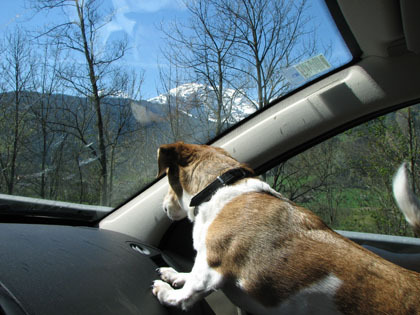 A dog ticket is also required and cost 69 euros roundtrip (subject to change). A muzzle is supposed to be required, but they haven’t asked me to put it on Bodie (thankfully as he hates them!). We are arriving in Rotterdam now, and will then be stopping in Antwerp and Brussels before arriving into Paris. Want to take your dog to Paris? Just email me for advice and personalized assistance! You and Bodie have a wonderful time together! So glad the ridiculous muzzle rule was scratched for you. It’s so absurd! Thank you, Helen! No one asked us to put on the muzzle – perhaps its mainly for big dogs? They did ask for the dog ticket, however. I just read your post that is imagining . really enjoy it and you dog is so sweet .